RESEARCH: Create a pdf of your research and upload it to the class drop folder. NOTE: For your homework to be considered ‘turned in’ and receive a grade, you need to upload a ‘Best’ quality pdf to the class drop folder. UCLA’s zero waste plan, study their website (sustain.ucla.edu) and review the ‘mytrash’ initiative. Monday, April 16: Team Research Findings Presentation—Teams 1 through 3. Wednesday, April 18: Team Research Findings Presentation—Teams 4 through 6. A research finding is a series of facts, a quote, piece of information, and/or image that stands out for its significance and power. RESEARCH FINDINGS: Today, April 9, you will be assigned to join a team with which you will share your individual findings and arrive at the most compelling group findings. Part 1 of the homework is for you to come up with your own research findings (10–15). Part 2 is to meet with your team in person, share your individual findings formally as a pdf and together arrive at the most compelling group findings (10–15) to present to the class. For your homework to be considered ‘turned in’ and receive a grade, you need to upload the ‘Best’ quality pdf to the class drop folder. Upload both the pdf of your individual and team research findings. UCLA waste facilities tour with Bonny Bentzin, Deputy Chief Sustainability Officer at UCLA. Continue working on personal and team findings presentation. RM lecture on social and political posters. Homework Due Monday, April 23: Visual Research Posters—Focus on Messaging. Homework Due Wednesday, April 25: Visual Research Posters—Focus on Messaging. Individual meetings + Work in class. Refine your posters’ ideas and messages, as well as focus on images—photographic and/or illustration. Conceive of symbolic images that you can photograph to convey your idea. You may use existing photographs, as long as they are appropriate to your concept, of high resolution (large enough for usage in a 36 x 24 poster) and properly credited. Homework Due Monday, April 30: Visual Research Posters—Focus on Images + Typography. Group A + B _ Individual Meetings. The final project Junk Battle! is a book comprised of two parts: a) Your Waste Awareness Project and b) Change a Habit Project. And two posters, one representing Your Waste Awareness Project and the other representing your Change a Habit Project (24 x 18). Your Waste Awareness project: Through words, drawings, diagrams, charts, and photography begin a documentation of all the waste you generate every day. Meticulously document 7 days of all the waste your produce. Change a Habit project: Conceive of a project based on the following stages for a more sustainable lifestyle: REFUSE, REDUCE, REUSE, RECYCLE, ROT and REPURPOSE. Your project can focus on one stage or all. Present the documentation of at least one full day of the waste you produce—photos, drawings, text. Select a couple of objects and explore various styles of photography, drawing and text. Select one object to present 2 variations of a) photographic style, 2) drawing style and 3) copy style. The copy of your object should include: Object description, materials/ kind of waste, location, date and time collected, and where will it end up: landfill, recycled, rot (compost), etc… You can also add a short story. Present each variation on a letter size sheet. Also, bring one full-day of your waste documentation, this can be unprocessed or processed with your selected style. Digital presentation. Bring 2 or 3 ideas of projects you would like to do. Articulate your idea with words and images, by writing a paragraph of the idea, bringing photographs of the objects you are planning to refuse, reduce, reuse, recycle, rot or repurpose. Digital presentation. Allow for the research to speak to you—listen and observe patterns, possible relationships (both, congruent and incongruent). In other words, through observation and play, allow ideas to emerge. Each idea is a pool of visual potentialities. Explore ideas, imagine what ‘it’ can be and make notes, both verbal and visual. Ideas are the images of thought. Ideas are stories. What is the story of the site that you will tell? Present your ideas with words and images—photographs, diagrams, graphs, maps, illustration, etc…These images can be only yours or references that represent your creative direction. Test printing: This week you need to experiment with printing—method: Laser, inkjet, and riso (if available). You need to perform the print tests on your final paper(s). Presentation: 1) continue presenting the next 10 final photographs of your waste (processed: color corrected, masked, etc. ); 2) a draft of your ‘page-by-page’ layout (thumbnails) of your entire book. 3) 2nd round of design refinement of 10 spreads (two facing pages) of your book. 4) Cover and chapter dividers design. 4) Bring printing tests on your final papers. Begin to incorporate the process documentation into your book. Present design for the Junk Battle posters (digital versions). You may choose to incorporate them to your book, if so, show them already inserted in your book spreads. Final design is due. Your book needs to be completely final so you have time to print. Printing takes many many hours and if something can go wrong, will go wrong. Presentation: 1) Bring the next 10 final photographs of your waste documentation (processed: color corrected, masked, etc. ); 3) Final design of all spreads of your book. 4) Bring your selected printing tests on your final papers. If you are documenting a process follow the instructions above of ‘Your Waste Awareness’ project. If you are making a physical object, you need to be in the final stages of fabrication. If the work is too large to bring to class, bring your fabrication process drawings, photographs, and prototypes, tests, etc… Otherwise, bring the actual object in progress. By Monday week 9, all of your photographs, copy, drawings, etc… of your project need to be incorporated into your book. Only left are the photographs of your final project, to be inserted for printing the final book. Let us know where you may need help with fabrication. 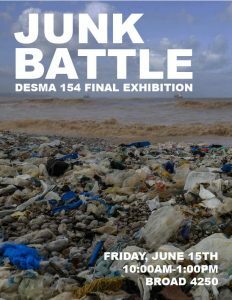 Present your final Junk Battle posters design. You may choose to incorporate them to your book, if so, show them already inserted in your book spreads. Begin printing your book this week. All of your book should be completely final, ready to print. Your project needs to be finalized this week. All project documentation/copy needs to be incorporated to the final book by Wednesday, except for the ‘hero shots’ of your final project which might still be in fabrication. Use ‘FPO—for position only’ photos in the spreads dedicated to the final images. Bring a proposal on how you will be photographing your final project. Present your final Junk Battle posters design (digital version). Bring all of your unused test sheets to use for the bookbinding workshop, as well as the samples of the various papers you will be binding into the book. You will need to bring to class: Bookbinding needle, bookbinding thread, x-acto knife, white artist tape, a paper weight (I use a jar, or bag, full of coins), a sharpened pencil, and a ruler. Some items can be shared. These items are sold at UCLA Ackerman, Blicks Art Store, and Hiromi. Online bookbinding tutorials (perfect, Japanese, sewing) are found in the class website under ‘Binding Guide.’ Please review them prior to class. Your entire book needs to be printed by now, including your covers and chapter dividers. We’ll focus on book binding techniques. You may use the class hours to bind your book. Be prepared to have to leave it in place for a few hours. All fabrication needs to be completed. Bring additional documentation of your project. Review student work. Individual meetings. *** Please bring your midterm posters for setting up for the exhibit. Please arrive at 9:30 to have all your work ready for presentation at 10:00 am. The presentation will go until 1:00.